Home > ADRL > AlAnabi Racing > News > Nitro Funny Car > Qatar Racing Club > Video > First Nitro Funny Car to race in Qatar! 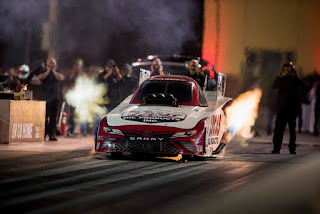 Del Worsham, a long time member of Qatar's Al Anabi Racing and two-time NHRA Funny Car world champion, shipped his Nitro Funny Car to exhibit at the ongoing Arabian Drag Racing League! There has never been a nitro funny car ever raced in the Qatar Racing Club so this was the first time a nitro funny car ever raced in Qatar. 'I have been friends with Sheikh Khalid ever since we raced funny car and top fuel dragsters in the NHRA. So I kept contact with him and kept coming over here to watch him race his pro mod team in ADRL! ''Del Worsham explains. 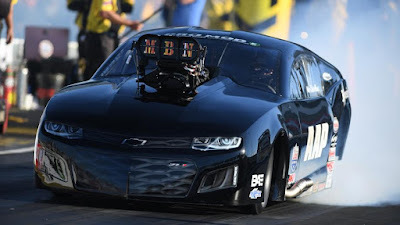 ''Every year I threaten to bring Nitro Funny Car over here and race it, have fun and who the people of Qatar what it is like to witness a nitro funny car! Then this year we were like...fine let's do it!'' Del Worsham speaking to NHRA Announcer Alan Reinhart in Qatar! The ADRL continues to the end of February! Today's race is the 2nd round of 6 rounds of ADRL scheduled for this season in Qatar! Todd Tutterow finished as no.1 qualifier for the second time with a 3.693s pass! Running a Mike Janis Supercharger on his SS Camaro, the team heads into the final race of 2nd round looking strong! Nitro Funny Cars can make over 10,000hp and accelerate from 0-100mph in less than 1second;0-300mph in less than 4 seconds! With so much power in it, how does it work? We caught up with Del Worsham Nitro Funny Car in Qatar. NHRA Announcer Alan Reinhart takes around what makes it tick!